Leaves impart flavor to iced drinks, sauces, vegetables and lamb. The plants are vigorous and spreading. 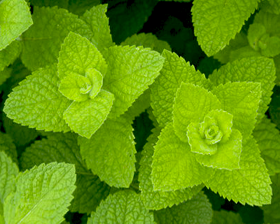 It has a remarkable reputation with indigestion, for calming the nerves, for soothing sleep and recurring sickness. Many herbalists claim it aids virility and can be used against Migraine. Prefers Part Sun to full sun. Sow seeds from late winter to early summer. Do not cover the seeds with compost. Make sure that the compost is moist but not wet and seal in a polythene bag until germination which usually takes 7-16 days at 21-24C.